So the latest little celebrity controversy seems to be that Gwyneth Paltrow playfully tweeted a version of the “N-word” the other day, referring to her friends Beyonce and Jay-Z. That explanation was not enough for many. And therein lies the complication with that word. Some Blacks freely use the word and defend its usage as a way to neutralize its power. Some rappers use it all the time, as Gwyneth rightfully pointed out about Jay’s song. I’m with Gwyneth on this one. What was she supposed to do, not mention the name of the song that Jay himself put out to the world?! Many of those railing against Paltrow of course used the logic that no white person should ever use that word even if Black people are allowed to. I disagree. I stand on the side that says the word should be buried completely. It is too charged a word to think it can be used positively in any way. So I say to anyone that thinks it is OK for Blacks to use the word, then accept that it is OK for anyone to use the word. If Jay-Z wants to put the word out there in such a large way, then Gwyneth and anyone else should be able to reference it. It’s one of the silliest things I ever heard to hear someone say a White person can never ever let the word come out of their mouth, even if they are saying the name of a song. That is just silly. If rappers want to make the word cool, or so they think by changing the spelling and pronunciation, then unless we want to protest that, we shouldn’t protest others thinking it is cool to say the word in a circumstance like Paltrow’s where she was clearly not being racist. Come on people. As this controversy shows, the word is not easily accepted. Put pressure on all people, including Blacks, that use it. Or accept that it is OK for Gwyneth and others to use it too. Here is a full article on the controversy, from someone who thinks Gwyneth was wrong, but it is OK for Jay Z to put the word out front and center all over the world. 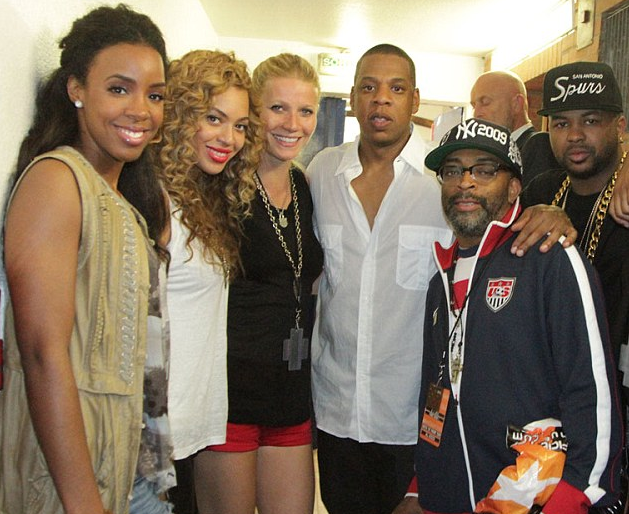 Jay-Z’s biggest supporters (people that actually purchase most of his concert tix and pay for his downloads are white). Him using the N word is irresponsible because these kids look up to him, follow him and want to emulate him. Why would he license people to use the word? Would he want someone to call his daughter that? Yeah, see, they are on stage and in the “winners circle” among people who wouldn’t dare call them that. What about the the African American child who goes to school with all whites? They white kids listen to Jigga and Kanye and think it’s cool to take that word to school with them. I really hate it. I’m glad you made this post. I really hope rappers get it. I am this biggest rap fan since the 80’s but it’s a new day and this music in now global, so we have to now be globally responsible to our race. Thanks Earnest for listening! I’m following now! Same here. I’m really old school and still mostly listen to that old stuff – Tribe Called Quest, Pete Rock and CL Smooth. Those guys rapped about different stuff. Don’t get me wrong now. I still love me some Rapper’s Delight too. But the point you make is a good one, rap is global now and the message goes to a lot of people outside of the urban environment. And thing is I’m a fan of Jay Z and Kanye because both are very talented. Which is why they don’t need that demeaning stuff. Omg Tribe! Oh the 90’s…..yes, so, to whom much is given, much is required. If you have legions of fans and easily influenced followers, you have to tread lightly. Remember KRS One? He knew how to do just that! Loving Drake, Jay and Kanye, but they need to be careful. OK, you are indeed old school too. When you can whip out KRS One, you are real. Brings me back.